Experience is sometimes an unforgiving instructor. At Homecheck we learned devastation caused by flood waters first hand when Cedar Rapids, IA was hit by a massive flood this past June (6/13/2008). Homecheck is parented by the company enlighten technologies™ which includes many other businesses in our family such as Lawchek®, LawyersListings, and HouseList, to name a few. Our headquarters on 1st Avenue in downtown Cedar Rapids was inundated with water after the Cedar River crested at 31.1 feet (19.1 feet over flood stage) to overtake 1,300 blocks of the city. * The first floor was completely lost and the second as well when water reached 4 feet on the upper level. A slow road to recovery, we have learned first hand the destructive power of flood waters. Reflecting on this experience and the items we have learned, we determined to write an article this month about what to do if a flood hits your home or business. We hope many of our readers never have to use the practical advice in this article. It is not always possible to know when a flood will happen. It may be caused by an inundation of rain fall. Cities in Iowa were affected in this way when the Cedar and Iowa Rivers swelled with over 10 inches of rain in only one week. ** This can then be compounded when man-made structures give way. This was seen in New Orleans when 50 levees broke during Hurricane Katrina. * So what can you do to protect your business or home before a flood happens? • Now that you know where your home or business stands, what kind of insurance is available? Talk to your insurance agent first. If you want to now more about insurance options, especially in higher risk areas, also check out the National Flood Insurance Program at www.floodsmart.gov/floodsmart/. • Whether a household or a business, you should have an evacuation plan in place. Let family members and employees know what evacuation route to take if water is rising swiftly and an evacuation is ordered. For households you should include a place for everyone to meet whether it is a local shelter or a relative’s/friend’s house. Also, families should have an out of state contact that everyone may call to locate each other in case they are separated. Personal Hygiene Kit – sanitary wipes or gel, soap, toothpaste, feminine supplies, deodorant, etc. • Back up your documents! If you are evacuated due to a flood there are certain documents you will need for claims and getting back on your feet. Keep a copy of these documents with your emergency kit, at a safe location other than your home or both. At the very least these documents should include: insurance information, social security number, and medical records including any active prescriptions. It would also be a good idea to make a list of emergency contact information including family and friends as well as local and state numbers you may need. • Prepare your business or home to resist flood damage. Suggestions include: install sump pumps with a back-up source of power, install backflow valves or plugs to prevent sewage entering the home, and make sure any fuel or propane tanks are securely and properly installed. • Once a flood watch or warning is given call local authorities and let them know of anyone who may have special needs and cannot leave the flood area easily. It is extremely helpful for authorities to know who needs help evacuating if an evacuation becomes necessary. Ideally, have a friend or family member who will try to get this person out first if it is still safe to do so. This way there is less chance of separation. • Get your emergency kit and keep it at hand in case of an evacuation. If you have some prep time before, fill up the gas tank to make sure you can go at a moments notice. If an evacuation is ordered there may be heavy traffic and you may need to go some distance to a shelter. • Secure any items outside that might become hazards in water such as garbage cans, lawn furniture, grills, etc. • If an evacuation is imminent: turn off the power and gas. If an evacuation is ordered, evacuate immediately. Use the route the authorities have given and make certain not to drive through flooded roads. • If you are not ordered to evacuate, stay home and listen to any future announcements. Unless helping a family member or friend for a specific purpose, stay off the roads and out of the way of emergency crews. Going to watch is not helpful and can be potentially very dangerous. • First you will want to contact your insurance company. Even if you are not covered for a flood, you will need to contact your agent. This is why it is important to keep documentation with your emergency kit. You need to know your company, agent (if applicable) and your policy number. In the case of evacuation, make certain to specify the address and phone of where you can be reached now. This may also be a friend or relative who can act as a point of contact if you are not immediately near a dedicated phone. They will set up an appointment to meet with you and discuss your losses.If they do not get back in a few days be persistent and call again, just keep in mind they may be overwhelmed with claims. • Work with authorities about your return. Although this part can be extremely frustrating, in the case of major floods they will want to assess the safety of your return before you may enter any neighborhood or structure. Choose representatives, as in the case of Cedar Rapids the first look at the property was restricted to 1-3 people depending on location. The authorities may have also set up a grade system for the status of your structure. In Cedar Rapids there were green, yellow and red signs letting owners know whether a structure was safe to enter, enter only with caution or too dangerous and deemed a total loss. • Once it has been deemed safe by the authorities for you to return, start the process of sorting your property. Do not throw out all items as you will need your insurance agent to see these. However, if the items are considered too toxic to keep around, get pictures and samples of the items before disposing of them. Make sure to take all precautions necessary before entering a flood damaged building! Click here for more details. • Take many pictures of the inside and outside of your structure before cleanup. Photograph any standing water, items that have to be disposed of immediately and general survey pictures of each room. Also, take pictures of the items that will have to torn out such as the walls, floors, etc. • Make a list of all damaged and lost items. This will help when you work with your insurance agent to process your claim. With your agent you will make a Proof of Loss. This statement is your testimony to the damages suffered. It should be filed within 60 days unless circumstances have allotted more time. Once this is filed with your insurance company your claim will be processed, however, it may take some time if the area was hit especially hard. • FEMA stands for the Federal Emergency Management Agency. As they state on their website they define their type of disaster assistance as “money or direct assistance to individuals, families and businesses in an area whose property has been damaged or destroyed and whose losses are not covered by insurance. It is meant to help you with critical expenses that cannot be covered in other ways. This assistance is not intended to restore your damaged property to its condition before the disaster.” In essence they are there to help those who could not or did not get flood insurance. • Items FEMA will cover are: temporary housing in the instance of evacuation or unlivable conditions, repair for what the insurance company will not cover (this is just until the home is safe, not necessarily with the same materials as before), and permanent housing construction. This last is only available to those who cannot get flood insurance at all due to location. Fuels for primary heat source (heating oil, gas). Clean-up items (wet/dry vacuum, dehumidifier). • When making any claim, you should have the following at hand: your social security number, current and damaged address, current phone contact, insurance information, household annual income, routing number to your bank to receive funds, and a detailed description of the losses. • You may be referred by FEMA to SBA which offers low-interest disaster loans. “Homeowners may borrow up to $200,000 for disaster related home repairs. Homeowners and renters may borrow up to $40,000 to replace disaster-damaged personal property including vehicles.” However, you can not receive duplicated aid already received from FEMA. • SBA stands for the Small Business Administration which has a specific branch for disasters the Office of Disaster Assistance (ODA) that offers federal low-interest, long term loans for “homeowners, renters and non-farm businesses.” An Economic Injury Disaster Loan (EIDL) is available to small businesses specifically geared towards helping with day to day expenses so a business may continue to operate. • SBA can release disaster loans if one or more of the following conditions are met: Presidential Disaster Declaration, • • Agency Physical Disaster Declaration (based on a minimum amount lost), Governor Certification Declaration, Secretary of Agriculture Declaration, Secretary of Commerce Declaration, or Military Reservist Economic Injury Disaster Loan (for businesses that lose key personnel who are called to active duty). • For Physical Disaster Loans which help replace an uninsured or under-insured property, an inspection team from SBA’s ODA will review the site and claims. • Applicants do have to show some reasonable ability to pay back the loans. However, since they are low-interest and can be as long as 30 years, they are easier to qualify for than standard loans. • Especially with real estate, the SBA’s ODA will continue contact with the borrower to make certain construction is on schedule and funds are being used appropriately. • You can reach SBA by calling 1-800-659-2955 8am-9pm EDT. Or email them at disastercustomerservice@sba.gov. FEMA and the American Red Cross have made a pamphlet entitled Repairing Your Flooded Home which is available as a PDF. A great resource, page 55 has a very useful emergency contact list as well. 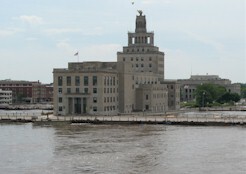 Downtown Cedar Rapids, Iowa on Sunday, June 15, 2008 after the waters have started to recede. The Safeguard Iowa Partnership and the Iowa Disaster Human Resource Council have partnered to provide the Aidmatrix Network, an easy way to make monetary and product donations to the nonprofit organizations that are assisting in the response and recovery efforts following recent disaster events in Iowa. The National Czech & Slovak Museum & Library staff and board continue to work through the challenges of flood recovery. Our five museum buildings are cleaned out and secure. Visitors from across the country have been calling to plan summer visits. Some have already made their way here and are shocked and dismayed to find a sight they never expected - boarded up buildings, sandbars in the garden, and piles of debris. We are assuring them we will survive and be back in business, but it will take time. To us it's surprising there's still a world out there that doesn't know about the flood! Corridor Recovery is a not-for-profit partnership between government, civic, business and faith-based organizations, created to respond to the Flood of 2008. As the flood waters peaked, Corridor Recovery quickly became the primary resource for materials and information for Linn County and Cedar Rapids. We provide resources for local governments and agencies to distribute flood-recovery information to the public in a critical time of need, and to coordinate volunteer efforts in the clean-up and recovery process. The Greater Cedar Rapids Community Foundation opened the Flood 2008 Fund on June 15. The Flood 2008 Fund is for flood relief and recovery donations. One-hundred percent of financial donations to the fund will support response, recovery and rebuilding efforts throughout the Cedar Rapids-metro and surrounding communities. The first priority will be to work with local nonprofit organizations to support individuals and families affected by the floods. The GCRCF is committed to helping individuals, families and the nonprofit community recover and rebuild from the catastrophic flood. Embrace Iowa is a program of statewide outreach by the Des Moines Register. Since it already has an established logo, identity, and donation tracking mechanism, the Iowa Disaster Collaborative is using the Embrace Iowa website as one way for donors to make a donation and learn more about the 2008 Iowa Disaster Fund. If you are interested in helping in a particular area of the state, please use this section of our Web site to get in touch with local officials, who are collecting a list of where and when volunteers are most needed. For those wishing to support the University as it struggles to recover from flood-related damage not covered by insurance or other resources, we encourage contributions to the UI Flood Relief Fund. FEMA has more than 2,600 full time employees. They work at FEMA headquarters in Washington D.C., at regional and area offices across the country, the Mount Weather Emergency Operations Center, and the National Emergency Training Center in Emmitsburg, Maryland. FEMA also has nearly 4,000 standby disaster assistance employees who are available for deployment after disasters. Often FEMA works in partnership with other organizations that are part of the nation's emergency management system. These partners include state and local emergency management agencies, 27 federal agencies and the American Red Cross. Congress established the National Flood Insurance Program (NFIP) to address both the need for flood insurance and the need to lessen the devastating consequences of flooding. The goals of the program are twofold: to protect communities from potential flood damage through floodplain management, and to provide people with flood insurance.